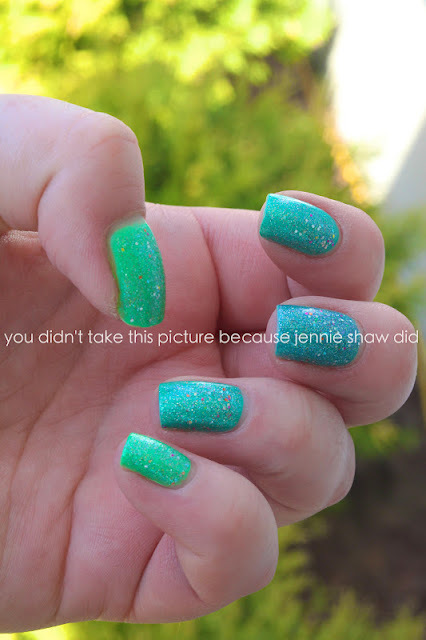 jennie's nails and tales: The Nail Files: Wanna See My Peacock? I've wanted to do a fade for a while so this week, I did! China Glaze's Optical Illusion, In The Limelight (neon), Turned Up Turquoise (neon) and OPI's Fly. That's two coats of In The Limelight on my pinky and thumb, Turned Up Turquoise on my ring and pointer finger and Fly on my middle. Then I put Optical Illusion over them all. You know, because sparkles are my life. Haha! They totally remind me of a peacock, so naturally, I've been strutting around for the last few days, fanning my fingers at every opportunity. But can you blame me? Haha! Ooooo I like those color combos with the glitter! Very nice! Very pretty. I love the fade! Love those colors! So pretty! I love the green/blue color combo! I love the peacock nails. I am wearing Optical Illusion right now. Love it! I have Turned up Turquoise and Sinful Colors Irish Green (which I think I could substitute for In the Limelight), so I will want to steal this mani idea from you at some point. Just so you know. . . Thanks. Beautiful!! These colors look fabulous together!